There are many famous names in the history of conservation. But there are also some not-so-famous ones, especially outside the United States. 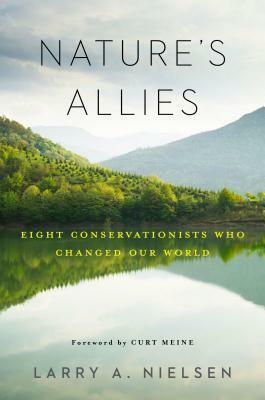 Nature’s Allies: Eight Conservationists Who Changed Our World highlights eight major players in conservation. Some are exceptionally well-known: Rachel Carson, Aldo Leopold, John Muir. Others you may never heard of before. Almost everyone has heard of John Muir. And while there is no real new insight into his life, it is practically mandatory to include him in this list. Born in Scotland, Muir moved to America at a young age. He was always a lover of the outdoors but he was also a genius inventor. His passion for conservation was matched by his incredible literary skills. Muir’s writings are what live on today and continue to inspire. He created the Sierra Club and went camping with President Theodore Roosevelt. Unfortunately, his favorite place, the Hetch Hetchy valley of Yosemite could not be protected from damming. It was this blow that has been credited with shortening John Muir’s life. Although he did live to be 76. Darling was a political cartoonist who lived in the frontier: Iowa. For a cartoonist for a newspaper in Iowa to make such an impact on conservation seems slightly outrageous today. But Ding’s artwork, simplistic at first glance, was full of meaning and nuance. These cartoons easily resonated with the public. They were easy to understand but more importantly, easy to share. His most famous cartoon was one rescued from the trash: a tribute to Teddy Roosevelt after his death. Darling fought for changes to Iowa law that led to the creation of the Iowa Department of Natural Resources (DNR). This became the model for other states. Darling’s influence, and a specific interest in wildfowl habitat, led him to the position of Chief of the U.S. Bureau of Biological Survey. In this capacity he added 55 new refuges to the National Wildlife Refuge System. Darling also produced the artwork for the first Duck Stamp. Duck Stamps continue to be the single most successful conservation tool for raising money with stamps purchased from hunters and birders alike. One of Leopold’s greatest strengths was his ability to change his mind from popular opinion to what he learned from doing. Aldo’s approach of taking used up or “trash” land and turning it into a native, restored habitat is one of the best models for conservation today. It is the model I am currently following to turn our own former cornfield into a welcoming place for wildlife. Carson was always a writer. Her first published story was at the age of 11 and her most famous work, Silent Spring, was one of many wonderful pieces of science and natural history literature. Nature study and the concept that you learn best in an outdoor environment, was commonplace at the turn of the 20th century. Yet today we seem to be moving further away from this idea. As an inward person, Carson did not need approval from others and it was her ability of such high focus that made her not only a great biologist but a great writer. Thanks to Carson, we have the Environmental Protection Agency (EPA) and DDT was banned (eventually). She fought her entire career against ignorance and sexism, all while battling her own illness, cancer. It was pleasant to learn about other conservationists I was unfamiliar with. Chico Mendes was considered the “Gandhi of the Amazon” a moniker he earned from being a protector of rubber-tapper rights and the benefits of extractive resources. Unfortunately, his desire to protect the forest and make it economically responsible also put him at risk. He was murdered at age 44. Billy Frank Jr. was a Native American from the Nisqually Tribe in Washington. He was arrested countless times for “illegally” fishing. He made it his mission to protect fisheries, especially for Pacific Salmon. “The army is a much better land manager than the Forest Service. You can deal with the army. The commanding general is the boss. It’s not like the governor or the president or the secretary of the interior. When I talk to those guys, I don’t know who the hell is in charge.” – Billy Frank Jr. talking about working with the military to exchange army land for use to build a fishery. Wangari Maathai was known as the Green Crusader and was the first African woman to win a Nobel Peace Prize. She fought to restore land in Kenya and all over Africa but was also a major catalyst in the fight for women’s rights. Simply put: she planted trees. Through her organization, the Green Belt Movement, she ended up planting over 50 million trees in Kenya alone. Gro Harlem Brudtland is the only living conservationist covered in Nature’s Allies. Gro’s (pronounced “Grew”) career is as complex as it is varied. She held numerous government positions in Norway including the first woman (and youngest) prime minister. Her most important position for the world of conservation was the chair of the World Commission on Environment and Development (WCED). The commission created a report in 1987 in book form called Our Common Future. It is extremely detailed and thorough and linked the connection between conservation and development. This spearheaded the concept of sustainable development that Gro is so well known for today. Why eight? I’m not sure. Why these eight? The author’s goal was to include more than the “usual suspects” and reach out globally. I found it wonderful to read about individuals I’ve personally never heard of. Sure, some of the “greats” were missing, but these eight make for a solid foundation for conservation inspiration. Each showed three key traits: passion, persistence and partnerships. Only one of the eight is still alive. These profiles work as a great introduction into conservation stars. Many lived during vastly different periods of time. But after learning more about these eight wonderful conservationists it made me think: who are today’s current, acting conservation superstars? This is something I plan to pursue further.